Did we mention that Uzbekistan is not a vegetarian's paradise? Neither is the secluded eastern province of Fergana, but at least there is a great selection of tasty fruit and vegetables, the bakeries are not too bad, and a couple of Chinese dishes have found their way into the region (some of them vegetarian). For more photos from the Fergana Valley, Navoi, the Nuratau Mountains and Tashkent, click here. Although we had an early start in Tashkent, it is already noon by the time we arrive at the Bolshoi Kanatka (the Big Chairlift) in the Chimgan mountain range. Click here for more photos from August 2013 in Uzbekistan. The Chimgan Mountains are a spur of the Western Tian Shan, with the highest mountain, the Greater Chimgan, reaching 3309 m. The area offers hiking possibilities in summer and skiing in winter, and with a distance of only 85 km to the capital Tashkent it seems perfect for a weekend day trip. But not by public transport, as we had to realize... We took the Metro as far as the eastern end of the city, then changed into a minibus to Gazalkent, from where we had to go by taxi. Usually, that means a shared taxi in Uzbekistan: You just book a seat and wait for other passengers to fill the car. Although it was a Saturday, however, nobody seemed to have the same idea of a weekend trip and after 45 minutes of waiting we decided to pay for all the seats in the shared taxi. We had recommendations for a nice hike starting from the Big Chairlift. „You just go to the waterfall! The path is easy to follow,“ our friend had said. When we arrive at the Big Chairlift, though, we see several paths, but no recognizable waterfall. „To the waterfall? It's best to take the chairlift up to the mountain and walk from there,“ one of the vendors selling Coca Cola and Kurut, the salty dried cheese balls, advises us. How convenient for us, as this means less time spent walking and the opportunity to research another potential tourist attraction on the way, namely the Big Chairlift. After all, we want to get as many sights, tourist attractions, activities, and restaurant and accommodation tips as possible out of this day trip. Soon we glide over alpine meadows and rocks at a height of about 40 meters. Better not think about the maintenance of this 1970s (or so) Russian chairlift. On top there is another kiosk with Coca Cola and Kurut and a small walkway leads to a lookout point. On one side of the path, tourists have knotted pieces of cloth to a fence, which now appears like a shamanistic sanctuary. "To the waterfall?" The warden points down a steep slope, but what looks like a path at first soon peters out. We end up scrambling down back to the bottom of the mountain to a larger trail, which we would have reached much faster from the road without the chairlift detour, and then up again towards the canyon with the waterfall. Soon the large trail disappears, and a vague path climbs up along a little stream and past some small cascades. In the canyon, the scrambling becomes more and more hazardous. "The waterfall?!" The elderly Russian couple (a stocky guy with hat and walking stick, his wife all in pink) – which may or may not have reached it – shrugs exhaustedly; it seems to be quite far and over difficult terrain. We scramble a bit more uphill and eventually give up and take another shared taxi to the shore of the Chorvoq Reservoir with its hotels and beaches. Today at least the lake seems a far more popular option than the mountains, with people bathing, surfing and paragliding. We have a look at the hotel rooms (not well maintained and too expensive) and watch some Spanish bus tourists busily walking around. Then we have a Coke in a classical heavy glass contour bottle on the terrace. There's a holiday feeling in the air, not least because of the contour bottle, we guess. And after a brief rest at the lakeside, we had back to Tashkent where dozens of people shove into the minibus before we can even get out. That's it: On a Saturday, people move into the city, not out of it. The Mizdakh Khan cemetery in the vicinity of Nukus has been in constant use for many centuries, probably from long before the Arab invasion of Central Asia. Indeed, pre-Islamic traditions of grave decoration survive until today. One of the oldest tombs on the cemetery, that of Mazlum Khan Sulu, dates from the 13th century and has been beautifully restored. The elegant brickwork patterns decorated with occasional turquoise-blue glazed bricks relates to Seljuk buildings as far as Anatolia, and to Mongol mausoleums constructed in Iran. In three weeks in Uzbekistan, we have already spent at least 50 hours in long-distance share taxis and buses. Between Tashkent and Samarkand, every share taxi stops somewhere on the roadside so that everyone can buy melons. The best option on the more or less bumpy roads is to fall asleep on the back seat immediately as the drivers speed over potholes and past country bumpkins on brakeless bicycles. Once Isa looked up briefly from her slumber to notice how the driver had hooked his safety belt over the handbrake, probably to appear law-abiding at of the many police checkpoints. Better not think about traffic safety. Gratefully, the road between Buchara and Beruni / Khiva has been greatly improved this year, about half of it being completely rebuilt and the other half repaired. Alas, the sanitary facilites are still awaiting similar improvements. Long-distance bus travel is generally far worse than the share taxis, though. We boarded the bus to Moynak a full 90 minutes before its departure, but already boxes of peaches had been installed under every seat, and a medley of rice bags, machinery, iron rods, vegetables, furniture and peasants were to follow, chewing tobacco, gossiping about the other passengers, and asking us about prices in Moscow because that was obviously where we were from. The minibus to the village of Sentyab, on the other hand, left before it was full, since all the passengers whom the driver expected were there. We then made a detour to collect a whole mud-brick oven to be fixed on the roof, and continued at a pace of 40 km/h to the village. This time we are visiting the more out-of-the way places in Uzbekistan, such as the Sunday market in Urgut and the abandoned fish cannery in Moynak. We spend much time in shared taxis and seemingly even more in streets and bazars asking for the right place to board the taxis. The old town of Khiva is listed as a UNESCO world heritage site, being a rare example of a nearly fully preserved Islamic town ensemble in Central Asia. Most of the impressive palaces, madrasas and monuments date from the 18th and 19th century when the Khanate of Khiva was an independent city state known mostly for its thriving slave market and ruthless ruler. But there is much to see in the surrounding countryside, too. An elderly man is already drifting in the salty water of the small lake, and two young lads are just heading for the changing rooms on the beach, while a family haggles over the price of a horse ride around the shore. Most visitors, however, make for the restaurant area. Although it is July and searing hot, the bathing season at the Qalajik Salt Lake hasn't started yet. A group of women has instead settled around a low table, and some of them are preparing meat dishes in the open air kitchen that guests can use for a fee. The restaurant proprietors offer cold drinks and hot tea. And Vodka, of course – for most Uzbeks the Russian heritage is still stronger than Muslim orthodoxy. One local Vodka factory, we learn the next day, was disassembled in East Germany after the Second World War as part of Germany's war reparations, and reassembled in Uzbekistan which then belonged to the Soviet Union. Our local expert considers the product one of the best Vodkas around – clearly due to the "German technology" involved. To the east of Khiva, already in the semi-autonomous province of Qaraqalpaqstan, the arid landscape is dotted with huge mud brick castles and city walls belonging to settlements some of which are more than 2000 years old. There was no unified rule in this part of Central Asia at the time, and to protect themselves from marauding nomads, the settled Khoresmians often built their towns as one huge wall with the houses forming the city perimeter and a large open but protected space where the livestock could be herded when there were enemies around. We imagine that there may often have been enemies, and that it probably was a rather smelly life. Some of these castles, or qalas, have palaces built inside them, others are smaller and may just have been palaces in themselves. Koj Krylgan Qala, an unusual round construction, was probably built as a fortified mausoleum but also used for accommodation. Today the qalas are just crumbling mud-brick structures in a partly irrigated desert landscape – but they are a worthy addition to the Khiva sightseeing circuit. During the day it may be 45 degrees, or 50 perhaps. We seem to have picked the hottest day in the always hot province of Surkhandarya to find the Bronze Age ruins of Jarqoton. Somewhere in the vicinity of the small town Sherabad, Jarqoton is not exactly a well-known tourist site. We knew that before, but it takes us about an hour to find someone who actually knows the place and points us towards a waiting Damas – a very small Hyundai van. In fact it then turns out that all the other passengers in the Damas marshrutka, which is going to a village called Pakhtabod ("Cotton Town"), recognize the name "Jarqoton", since the archaeological site is situated right by the roadside and has a rusty iron sign at the entrance (if nothing else in terms of infrastructure). At 10 am, the young man sitting next to Natascha is just opening his second bottle of cheap beer and muttering in Uzbek. “You are from Germany, eh?” “And you are from Pakhtabod, I guess? Actually, alcohol is not good for your health...” Stunned, he stops drinking for the next ten minutes. Jarqoton was not the only ancient city we hunted down during our stay in Termiz and while most people spent the heat of the day in the shade, we trotted through mud brick walls and tried to figure out the lay-out of long forgotten towns and settlements, while drinking bottle after bottle of water without ever noticeably sweating. By the evening we could scrape a salt crust from our décolleté. Nor did we feel hungry, but the vegetarian choices in Termiz were very limited anyway. There's always soft ice in one of the many ice cream parlours that have one flavour each (caramel with chocolate sauce, mostly, but one had strawberry ice cream). As for dinner, we ended up with bread and tomato salad and something called “Greek Salad” on most evenings. The waitress in the Malika restaurant also recommends a different salad when we ask for anything without meat, or chicken, or ham, or fish, or bacon. When she brings the dish we point to the obvious chunks of meat. "No meat!," she insists, pointing to her tongue: "~o ~eat! ~o ~eat!" Later, in the Internet café, we make the acquaintance of Yulduz and Rocham, two German teachers from Boysun who came to Termiz in order to download some German news texts – the mountain town of Boysun does not have Internet. "What is the name of the German President?" "How long is the river Rhine?," they raid their memory of their own latest German language quiz for conversational topics. As we part, they comment: "We are quite content with your German!" After five days in Termiz we moved on to Bukhara, where Isa got ill with fever and a very strong headache. The summoned doctor suspected a sun stroke and prescribed transfusions, and luckily after two bottles of glucose solution Isa felt better again. The huge necropolis of Shah-I Zinda was turned into an open-air museum during Soviet times, but now it has become a centre of pilgrimage again. Shah-I Zinda means the “Living King”. Legend has it that Qusama Ibn-Abbas, a relative of the Prophet Muhammad, who brought Islam to the Samarkand region in the 7th century, continues to live in a cave underground. In the following centuries people wanted to be buried close by this holy man and a row of beautiful mausoleums were built next to the (empty) mausoleum of Qusama Ibn-Abbas. There is huge modern cemetery behind the Shah-I Zinda complex. We are writing this from Termiz in the south of Uzbekistan, where Internet is rare and slow (and dangerous, as some may have noticed). Since we are very busy, updates are also rare and slow. We are working on it. As long as we can remember, our image of Silk Road towns was blue. Blue domes, blue tiles, blue sky. The bus moves slowly through the desert, it is too hot, and everyone is slumped drowsily in their seats. Suddenly someone stirs and looks out of the window. We are coming to a town. There is a huge blue dome visible from afar in the blue sky: The Mausoleum of Khodja Ahmed Yasawi in Turkistan. 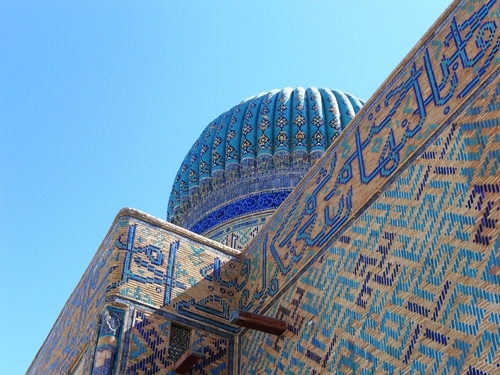 Although geographically in Kazakhstan today, architecturally it belongs to the blue-domed monuments of Samarkand, Bukhara and Shakhrisabz in Uzbekistan. A lot of them are built by the Timurid Dynasty. Its founder Timur was born in 1336 in a village south of today’s Samarkand. He became leader of Transoxania in 1370, and at the height of his rule (around 1400) his realm spanned from India to Russia. Due to a limp acquired in battle, he was also called Timur-i-Leng (Timur the Lame), a name distorted to “Tamerlane” in the West. While he slaughtered his defeated enemies with excessive cruelty, he spared the best artisans in the conquered towns and brought them to his capital Samarkand to build magnificent madrasas (theological universities), mausoleums and mosques. In Uzbekistan, Timur’s home country, many of the most beautiful examples of Timurid architecture have been restored to their former glory. At the same time, the traditional harsh way of dealing with enemies of the state is also well-adhered to. Tanks and machine guns guard the entrance to the Ferghana valley, where civil unrest and demands for independence from Uzbekistan have spread in the past years. Groups of bored militias patrol the streets and metro stations of the capital Tashkent and control passports at random. We have often seen people being led away for no apparent reason. “I have been arrested in the metro twice, and once all the foreigners were evacuated for several weeks to be out of the way for police raids”, a cheerful American working for the UN told us. Locals complain about the arbitrariness of police controls – and have no choice but to pay bribes so often and so openly that even we foreigners notice. We are now curious (and a bit worried) to see the historical legacies in Turkmenistan: Timur or Stalin? Our five-day transit visa is valid until 18 September, well ahead of the Independence Day in October. Apparently, no visas are issued for the whole of October in order to keep all foreigners away during the celebrations. As we suppose there are no Internet connections from Turkmenistan, we will (hopefully) be in touch again from Baku (Azerbaijan). Blogging – the ideal communication mode for world travellers? Researchers of new information and communication technologies (ICT) who are interested in online communities usually end up in, well, offline communities. Most of those people spending hours chatting or sending each other e-mails or SMSs are classmates, family or otherwise meet every day. Often they could just walk into the next room to see the person live, rather than downloading the newest photo. A (self-) experiment by Ducke and Thoma (2006) indicates that the reverse is also true: Spreading information via the Internet and communicating online does not work well in widely dispersed groups. We had some discussion in German about this in e-mails and in the blog comments, and decided to postpone our next entry about the Silk Road and to join the meta-debate. We know from access statistics and feedback that only a relatively small number of people regularly visit the site. Although there are several options for feedback, even fewer comment on the contents of the texts and photos. Like most people, we don’t exactly cherish the idea that our friends don’t care or just forget about us. Indeed we have urged them to look at the blog to the point of feeling like bullies. However, we are not seriously concerned that we could, say, disappear in Turkmenistan without anyone noticing. And we do get positive feedback (and compliments) that always encourages us. But when we created the blog we hoped to reach more of you in this way, and we hoped to use it as a dialogic tool rather than just a one-way medium of information. The communicative aspect (as comment or e-mail) is important to us for several reasons. First, we cannot adjust the style and amount of our photos and postings if we cannot see your reaction. If we met you to show a pile of photos after a year of travelling, we would hopefully notice when more explanation was needed, or whether you got tired and hungry – but how should we notice on the blog? Second, we move in countries where we meet few people with whom we could communicate: Tourists are rare, and most local people speak, at best, Russian. Thus, your thoughts on our observations can provide us with new perspectives (special thanks to Ursula here). And third, we are actually quite locked off from news – not just from news about the lives of our friends (that we do not think boring at all, as some of you seem to think), but also from world news. 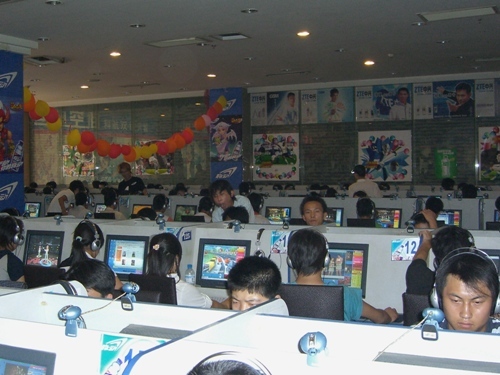 Without English newspapers and with irregular, slow connections in Internet cafes, we are likely to miss something important that everybody else is talking about. For example, we only found out about the attempted suitcase bombings in Germany when we spent an afternoon in the library of the Goethe Institute in Tashkent. And we just forgot about the LDP elections in Japan. We understand that it is us who have changed our lifestyle and that we cannot demand you to adjust to it. We enjoy travelling, and we like to share our experiences with you. However, it seems that we receive less information from you the more we tell you about us. We also know the blog is a form of communication that we have selected, and that it may not be your preferred choice. Still, we can think of no better one. For us, too, blogging is a new experience, and we are looking forward to exploring its possibilities. The blog is password-protected and not listed in search engines. Only about 50 to 60 people have access. We both have individual private e-mails that we check regularly, plus a joint e-mail. And: We will not quote without permission! PS: A few months after this post we lifted the password protection. The blog is now openly available - and so are the comments made after the conversion.